HolyMama is proud to support the following retreats who are ´sisters´ of HolyMama. Wombfulness, organises WombfulMama Retreats for pregnant mums and retreats for mums & kids in The Netherlands. Marjolein Vos, mother of 4 daughters, coach & inspirator around pregnancy, birth and motherhood and founder of Wombfulness creates safe havens for women who desire to get inspired and empowered. Pillars & Stone offers mother & child yoga retreats and parenthood transition coaching. Our retreats provide time away for you, and precious time to connect with your little one. We create the space you need to connect with yourself, your child and immerse yourself in our beautiful mama community, whilst taking some time to refocus and recharge. You will walk away feeling rested, relaxed and strong thanks to our program of yoga, meditation, mindfulness, coaching and of course delicious nourishing food. Holidays With Intention are encompassing workshops, yoga and mindful activities for personal development for men and women, entrepreneurs, partners, couples, friends, parents, children and families. This “brave new world” where Leaders are taking action towards providing a place for those whose curiosity for a purposeful and intentional way of living has been ignited. We are all Leaders of our Lives. A conscious way of living that is healthy, in integrity and expansive for the individual, in relationship, with children, as parents, as elders, within families, our work place and communities at large. After having a baby, Karolina lost sight of ‘herself’. Karolina paused and gifted herself time to retreat, which after many stressful and hectic years helped her to reconnect and enabled her to be more present in her own life. Karolina's dream was to create a ‘sacred space’ retreat designed for mothers with their kids in the most beautiful location on the planet. She believe's that each mother deserves a pause to empower and to reawake their dreams. A happy mother indicates a happy life and healthy family. Angela has worked with travel, event planning and food & beverage organisations internationally. Angela is passionate in hearing about peoples background, culture , family and life stories, she loves to help and connect people with similar interest and needs, and is also a mother of a 2 year old girl, who is a gentle soul with an unforgettable laugh. After a very trepid start to motherhood, she was burnt out and needed a place to go and rest with the little one. Angela found Claudia Spahr and needless to say, it was a life change, the retreats combine all her work experience and passion for people. It Takes a Village Retreats are a 2 day retreat located in Saint Martin, California and provide a retreat for mother and child. A time to disconnect, rest and reconnect with yourself. meet like-minded mothers while your children are an arms length away. Immersed in magical settings you will discover divine feminine wisdom, experience sacred embodiment and leave with a renewed sense of vitality. 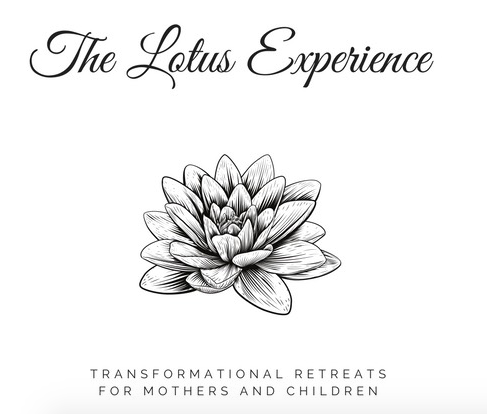 The Lotus Experience retreats are an opportunity to have a full reset. To take some time to breathe and align with your true essence. Learn yoga and meditation practices that invite a deeper sense of balance into your life. Eat nourishing high vibe foods, get a massage or a facial, engage in creative play with your little one, and take some time for you. The team of nurturing caregivers takes care of your little one/s offering a conscious, loving approach.